In theory, drinking spring water is health promoting. But as is the case with all types of drinking water, the water source is the key. 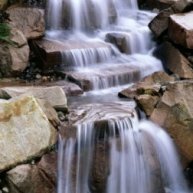 True spring water is captured from a natural, mountain, or artesian spring. When harvested properly, spring water is sparkling clean. Since water is one of the most critical components of the body, even minimal dehydration can hinder your sports performance and ability to recover from any type of exercise. The reason for this is simple: water composes about 75 percent of muscle tissue and about 10 percent of fatty tissue. But more importantly, water regulates body temperature, aids digestion, protects vital organs, cushions joints, facilitates cellular communication, transports nutrients to the cells, and removes waste, including lactic acid (the primary cause of exercise-related muscle soreness). If you can get drinking water from a local natural spring that is tested regularly for contaminants, you are lucky. Collecting and drinking your own spring water is your best choice—in terms of both water quality and expense. However, in my experience, bottled spring water is another story because you never really know the quality of water you’re getting—or if it’s even spring water! According to the Natural Resources Defense Council (NRDC), bottled water is inadequately regulated by the FDA, which allows bottlers to call their product “spring water,” even if it doesn’t actually come from a natural spring. In addition, the marketing for many bottled waters suggests that the water comes from pristine sources, such as mountain springs or glaciers, when it does NOT. In fact, up to 40 percent of all bottled water actually comes from tap water, regardless of what it says on the bottle label. And to make matters worse, the bottled spring water may be treated with chemical disinfectants such as chlorine. Thus, drinking spring water is healthy—if you know that the water is, in fact, from a natural spring and has not been treated with chemicals. I believe true artesian spring water is the best of its kind. However, if you are buying bottled spring water and intend to drink it on an ongoing basis, it would be worth your while to thoroughly research the bottlers to find out what their water source is and how often the water is tested for contaminants. Personally, I don’t have any interest in researching bottled waters, mainly because I am not in favor of adding more plastic waste to our environment. If available, I would happily drink spring water from a local reliable source, but my healthiest drinking water choice at this time is ionized alkaline water.